If you were staring at the browser who had to wait around for a response for those 236.79 milliseconds, you’d be hard pressed to find out what was going on. Maybe that time reflects RTT (roundtrip time) and my server responded instantly. Or maybe my server had to do a bunch of custom work to hand me back the bytes of my stylesheet. If I want my TTFB to be shorter, where do I focus my efforts? Being able to collect and expose this timing information is important because, although the Navigation- and Resource-Timing APIs do a fantastic job measuring the work that a browser has to do when making requests, those APIs don’t help at all when it comes to the work that the server has to do to fulfill those requests. Even invaluable tools like Charles and Fiddler can’t provide any insight about exactly what happens after the request leaves the client and heads out into the tubes of the internet. The dirty little secret of the above diagram (that we all know and love) is that it is not nearly drawn to scale. The slowest of the above buckets are typically the “Request” and “Response”. But further, it usually takes WAY longer to formulate the response than to ship those bytes back to the client. How much longer? Well, we looked at a few billion beacons for a subset of our retail customers over a multiple week period. The data showed that half of their resource requests were stuck in the “Request” bucket SIX TIMES (or more) longer than in the “Response” bucket. This means that we have ZERO visibility into the slowest and potentially most problematic bucket of our diagram. And that’s exactly where Server-Timing steps in – it allows us blow up the blackbox between requestStart and responseStart, so that we can uncover the cause of slow TTFBs. Server-Timing, the newest of the *-Timing web performance APIs, provides a mechanism for developers to supplement the navigation and resource performance entries with timing data collected on the server. The API is available as of Chrome 65, Opera 52, Firefox 61 (https only), and Safari 12 (behind an experimental flag). Server-Timing: db; dur=238; desc="db call on base page"
The only required field for a Server-Timing entry is a name – both duration and description are optional. Visualization tools (like browser devtools and RUM products) may try to interpret your data – charting your duration in milliseconds and preferring your description over name as a more human-readable label – but the truth is that duration is any number and description can be any string. You can think of Server-Timing a bit like User-Timing on the server – that is, you don’t get anything for free. You, the developer, need to instrument your backend code to benefit from the API. Let’s take the simple example (using Node.js/Express) of serving an avatar image, where we verify that the requesting user has access to the image, and then we check our cache to decide if we need to make a database call. In this example, checkACL() and loadFromDatabase() are potentially costly synchronous operations. Let’s instrument those methods to leverage the Server-Timing API. Here you can see that we have wrapped the checkACL() and loadFromDatabase() function calls into new anonymous function expressions. We pass each function expression into a helper method named wrapServerTiming(), which times the execution and writes out the Server-Timing header to our response. There are already many libraries that you can leverage today that makes instrumenting your code for Server-Timing a lot less manual. If you search on npm or github, chances are you will find a library for your stack. We’ve seen libraries for Node.js, Python, Ruby on Rails, C++11, ASP.NET Core, Elixir, Django, and Magento. Server-Timing data can get pretty verbose. Until we have native compression in the browser, you will want to consider apply custom compression to the entries you’ve collected. More detail on how we do it can be found here. Because the Server-Timing API uses response headers on the wire, you will be able to debug your entries just like any other header, by using a proxy or the network tab of your favorite browser. Developer Tools in Chrome and Web Inspector in Safari both attempt to visualize your timers under a new “Server Timing” section under the “Timing” tab for a particular network request. As you can see, each Server-Timing entry for a resource gets a row, and the duration value is charted using the same timing scale as the above section. Because Server-Timing only provides a duration (and not a startTime) the horizontal bars are pushed all the way to the right. If a resource is cached in the browser, then its headers (including Server-Timing) will be cached as well. Developers need to be aware of this to decide which data should be reported. For example, cached Server-Timing entries that report on actual back-end timers should probably be ignored, lest they skew the overall results. But, if Server-Timing is being used to communication metadata about the resource (image dimensions, which edge server, etc), then cached Server-Timing entries are still true and meaningful. Using Resource-Timing, it’s fairly safe identify resource requests that never actually left the browser like this. Collecting and aggregating the cdn-cache status of all the resources we serve has allowed us to bubble up a new metric in our mPulse dashboards called “CDN Cache Hit Ratio”, which we also have broken down by content type. Our new CDN timers help us “carve up” the “blame pie” of the request/response exchange. When we have the resource cached at the edge, you are going to see very very low edge times, which is good. But if the edge has to wait for data from the origin (uncacheable API calls), that’s when you’ll need to start paying very close attention to the origin times for your site. With transparency about the services we provide in mind, we think that all CDNs should emit these Server-Timing entries. 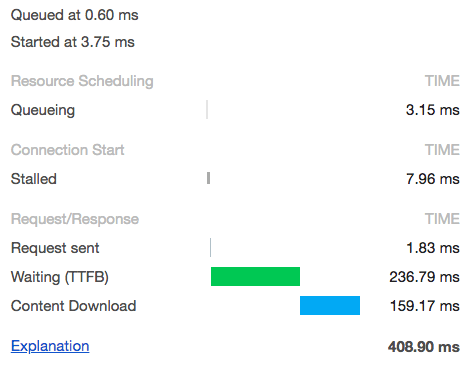 Doing so would allow our users to quantify in a standard way how well we are doing at offloading their traffic. Remember that the duration and description fields are really just a number and a string respectively. Let’s take a look at some other use cases we’ve found for Server-Timing. Collecting and reporting on the cache source of our resources will allow us to monitor our caching strategy, making sure our assets are cached as close to the client as possible. Ideally, your RUM tool allows you to setup alerts based on custom data. That way you can be notified should your caching regress. Let’s look at an example where a site provides some personalization by showing the users avatar somewhere in the header of the site. title="Welcome to our homepage, Clark Kent!" As all of those are dynamic, being based on the current user. Wouldn’t it be cool if we could retrieve all three pieces of data with just one network request? With Server-Timing and PerformanceObserver, you can! Server-Timing: title; desc="Welcome to our homepage, Clark Kent!" You can see the code for a prototype of this pattern here. As mentioned in @yoav‘s WebPerfWG meeting summary post, the good folks of the Distributed Tracing Working Group are exploring using Server-Timing headers to help them stitch together server-side traces, potentially using reserved traceparent and tracestate entry names. Whether standard or not, web-exposing backend logs via Server-Timing can help developers debug network or backend issues directly from the UI. Developers can ship down transaction IDs, server context, or even full URLs to other backend monitoring systems – perhaps only when a cookie or other request header is present. Pre-correlating diagnostic URLs allows developers to drill into those backend traces, directly from the console or devtools of the browser, with just a click! it would very easy for you to aggregate the total bytes saved for a given page load, like this. Let’s say you are A/B testing your all-important hero image. If you hold the URL for each experimental hero image constant, and make the bucketing decision during the image actual request, then you can use Server-Timing to communicate which experimental bucket the user fell into. Server-Timing is a fairly lightweight way of web-exposing data collected from the server. Developers can use it to bubble up timing or any other information about network requests to the browser, which makes it easy to correlate with other RUM data. If your organization is making use of Server-Timing in a unique way, I’d love to hear about it – hit me up on the twitters and tell me all about it! Many thanks to Nic Jansma, Colin Bendell, and Yoav Weiss for the editing, motivation, and overall awesomeness. Charles Vazac (@vazac) is an engineer working to make the web faster and better at Akamai. As a member of the W3C Web Performance Working Group, he is an editor of the Server-Timing spec. He also was recently selected to the AMP Advisory Committee. He loves fast websites, IFFEs, his TI-82, and running in above-freezing temperatures. He bloviates at vaz.ac. Great article. I used to pass custom headers to signal which CDN was the origin, along with some debug headers. Having the option to do that more natively with Server-Timing is great. I see big benefits for RUM-based backend-timing monitoring solutions. It’s IMO a lot easier than instrumenting log lines with durations. One small nitpick: the alt attribute is a fallback in case the image does not load. So having that info piggybacking off of the image itself defeats the purpose.